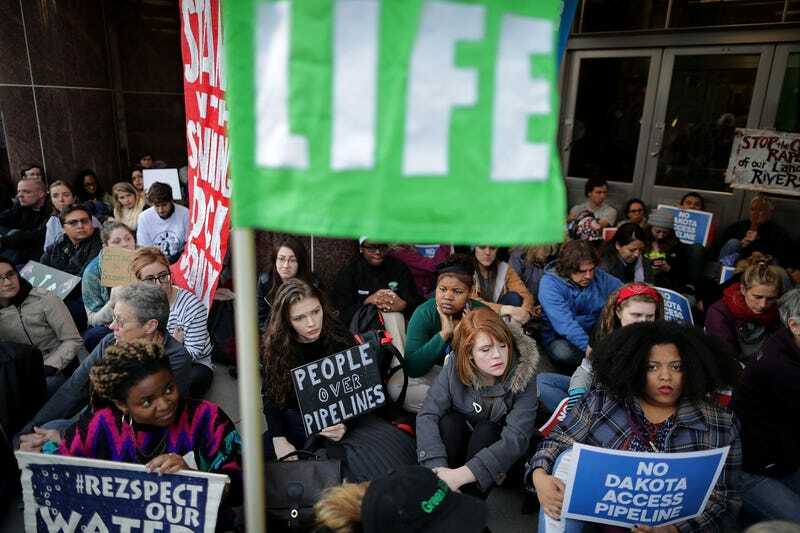 Hundreds of people sit in silent protest against the proposed Dakota Access Pipeline outside the offices of the Army Corps of Engineers on Nov. 15, 2016, in Washington, D.C. Demonstrations against the construction of the Dakota Access Pipeline took place across the country Tuesday as part of the #NoDAPL planned day of action. “Indigenous leaders are calling on us to take to the streets and disrupt ‘business as usual’ one week after the election to demand that President Obama’s Army Corps of Engineers and the incoming administration stop the Dakota Access Pipeline,” the announcement on the official website read. Supporters were encouraged to join a massive day of action Tuesday in solidarity with those at Standing Rock and demonstrate at local Army Corps offices, at branch locations of banks funding the project and at the offices of companies building the pipeline. “We fully support the rights of all Americans to assemble and speak freely, and urge everyone involved in protest or pipeline activities to adhere to the principles of nonviolence,” the statement read. Colorlines reports that people in more than 300 cities around the nation and the world, including San Francisco, Philadelphia, Milwaukee, Atlanta and Edinburgh, Scotland, took part in the demonstrations. David Goldtooth of the Indigenous Environmental Network addressed the Army’s announcement and in a post to his Facebook page encouraged his followers to continue to protest against the pipeline, noting that a delay in construction of the pipeline is good news, but not a victory. “They are still constructing everywhere else,” Goldtooth wrote. “The only victory is when the Army Corps or President Obama revokes the permits, pulls the easement and orders a full Environmental Impact Statement. “We still need to keep the pressure up!” Goldtooth added. Goldtooth said the fight is not over. “DAPL and police are still flying planes over us. They still have snipers on the hilltops. They are desecrating mother earth for the expansion of the fossil fuel regime,” he wrote.